Congratulations to our Sea-Doo Image of the Week winner Sarah Taylor. 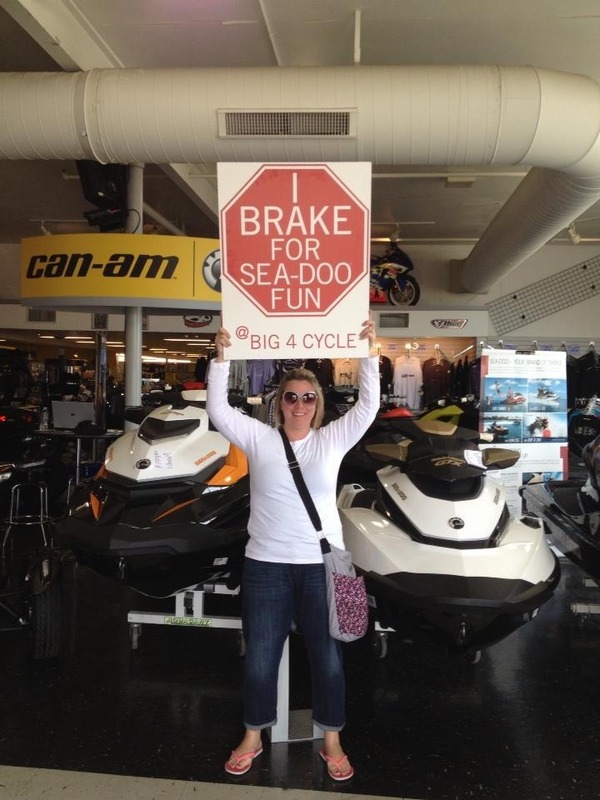 Sarah visited Big 4 Cycle & Marine in Evansville, Indiana and took her photo with our “I Brake For Sea-Doo Fun Sign.” The contest was extremely competitive this week and only 15 votes separated the 1st and 2nd place images. Sarah entered the Sea-Doo “I Brake For…” Sweepstakes and her image was chosen as one of our featured images of the week. Her image received the most votes in the weekly contest. She won a Sea-Doo Speed Tie that bolts directly to the dock. This Speed Tie provides quick and secure mooring and eliminated excessive ropes on the dock. So, the next time she goes to dock her Sea-Doo it should be quick and easy to secure it to the dock. Congratulations Sarah! Thanks for sharing your Sea-Doo lifestyle with us! 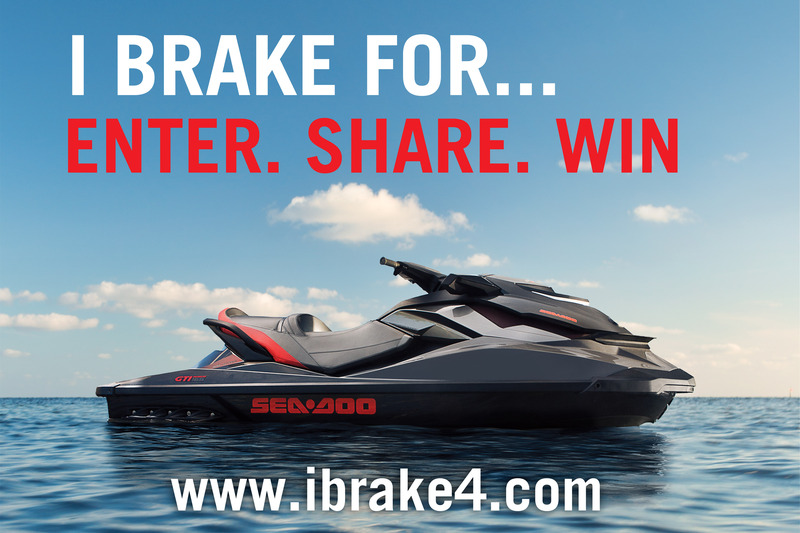 BRP is launching the Sea-Doo “I Brake For…” sweepstakes giving watercraft enthusiasts, and those new to boating, the opportunity to win a 2013 Sea-Doo GTI Limited 155, paired with a Sea-Doo MOVE trailer. Sea-Doo watercraft provides the stopping power with the only on-water braking system and invites consumers to share what special moments and destinations they stop for with their families. The Sea-Doo “I Brake For…” sweepstakes provides multiple ways to enter and opportunities to earn additional entries by simply involving family and friends. •“I Brake For…” Special Moments and Destinations: Participants upload an image of their favorite moments and places, it could be a family day on the beach, a shot of an epic sun-set, a pod of Dolphins, etc. •“I Brake For…” Sea-Doo Fun at the Test Ride Tour: The “Sea-Doo Test Ride Tour” includes 22 tour stops throughout the US. Participants can register and attend one of these events to test-drive a Sea-Doo watercraft, with the world’s first and only on-water brake. While there, they can take a photo holding the Sea-Doo brake sign at the event and upload it to the contest. To learn more about, and register for, the “Sea-Doo Test Ride Tour” visit http://www.seadoodemo.com. Once the photos are uploaded, contestants are encouraged to share their photo with family and friends. Contestants earn an additional 10 entries for each contest that they enter and share. For a look at the new Sea-Doo watercraft, visit: www.sea-doo.com.